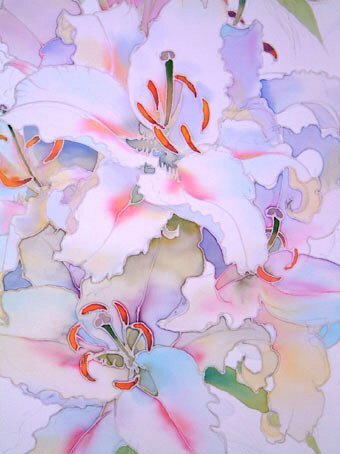 I pinned the silk tightly and evenly to a wooden frame then took it out into the garden where a beautiful clump of lilies were in full flower. 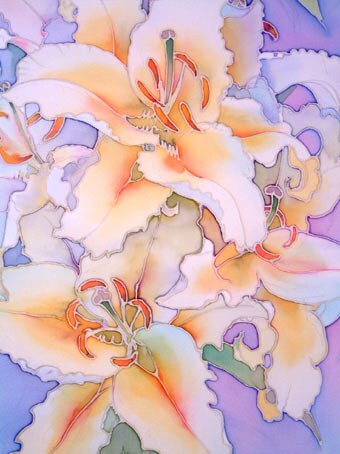 I drew the lilies directly onto the silk very lightly, using a 3B pencil, then, ignoring any pencil lines I was not happy with,I applied the gutta resist lines over the pencil lines taking care not to leave any gaps. I then damped the silk with water and applied the first washes into the petals. The colours blend gently into each when applied to damp silk. My palette consisted of steam - fix dyes in the following colours: magenta, golden yellow, ultramarine and cyan all diluted considerably for these delicate washes. 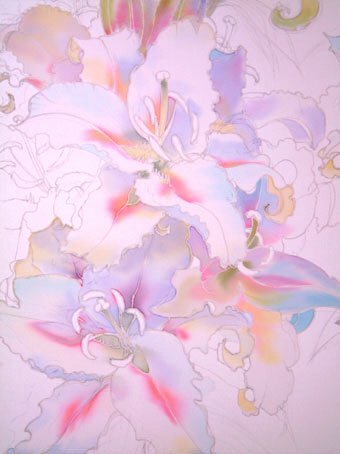 The flowers were damped and painted one by one as the silk dries quickly. 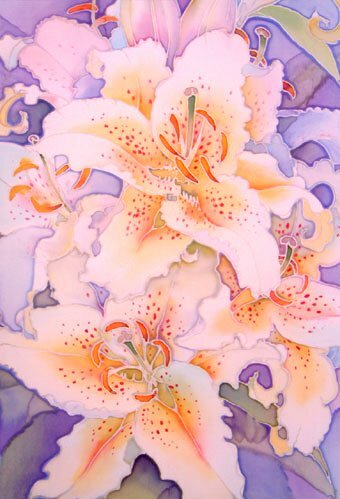 I painted in the stamens wet on dry, using the point of the brush to just touch the colour onto the silk. Dye on dry silk spreads to fill the spaces neatly. I then started painting in the leaves, blending different shades of green into each other. 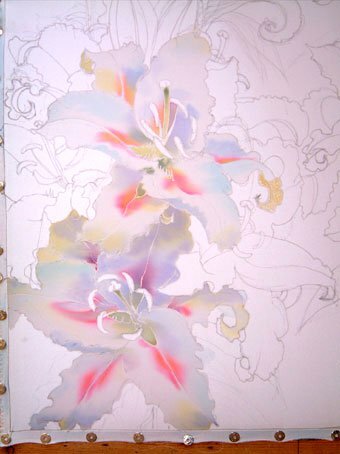 I then applied the first blended washes of colour into the background to define the petals. 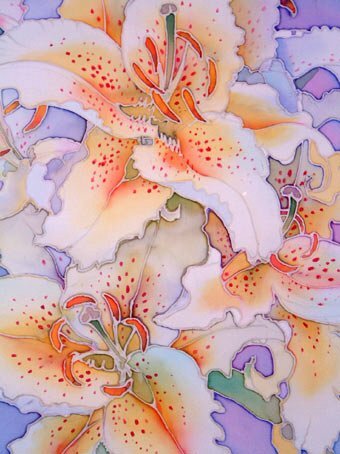 The lilies were then damped again and a wash of yellow was lightly applied to the centres of the flowers and a little more tone was added to the petals. When the petals were dry, I used a little red, mixed with thickener to stop it spreading, and touched in the spots on the petals. silk painting, 20”x 16” (51x41cm). Further washes were added wet on dry to the background to give the impression of leaves and shadows and increase the tonal contrast. Where the washes run across dry areas, watermarked edges form. I controlled the spreading colour using a hairdryer.